Prozac and the community of resilient older folks challenged by losses of their own propel Meredith, often against her will, back into the land of the living. Meredith learns that most people carry some sort of burden, but it's still possible to find meaning, purpose, and joy—and sometimes, even love—along the way. This book follows Meredith Mancuso who is still reeling from the death of her fiance, she has cut herself off from the world even being a successful writer hasn't gotten Meredith out of her depression. Then there is Prozac a spirit dog who helps those in need. When the lady Prozac is with winds up hurt Prozac winds up with Meredith. Can Prozac help Meredith break her funk? I loved this book it was so great to see where Prozac and Meredith would wind up in the end. The relationship between the two Prozac slowly helps bring Meredith back into the world and get past her grief and being sheltered away. It's a great book for dog lovers, or pet lovers in general. If you haven't had a chance to read this book you should you won't be disappointed we could all use someone like Prozac now and then! 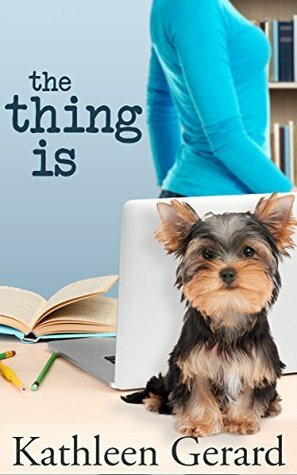 Thank you for profiling THE THING IS on your blog and for taking the time to read and review the novel. Much appreciated! you very welcome what a great book! Cozy Discussion #2: Romance and Love Triangles? Cozy Discussions #1: Why Authors Use Aliases?